This particular grouping looks really nice together – the attraction of a fabric line, I suppose. 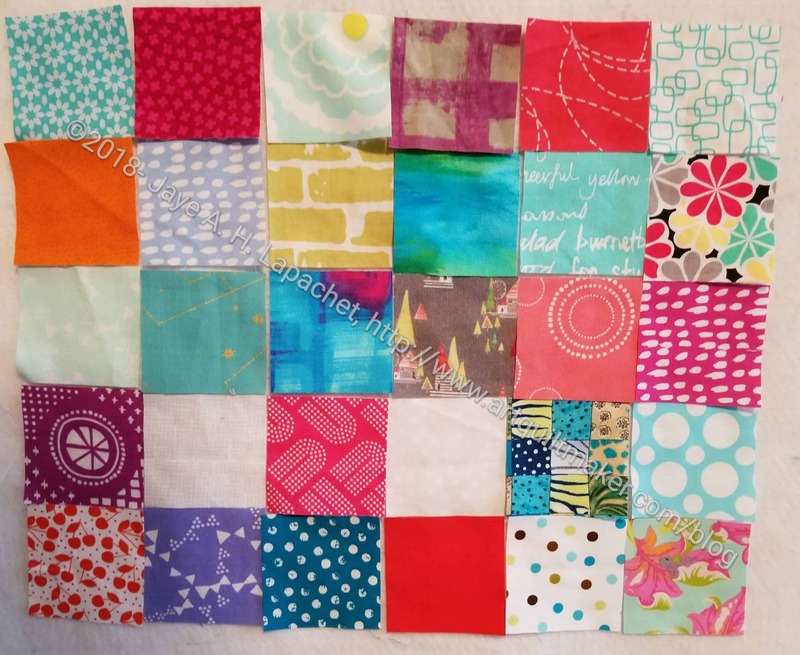 My quiltmaking supplies and tools are put away while I care for the YM, so this may be the last group of patches for FOTY 2018. There are still a few days until the end of the year, so we will see. Author JayeLPosted on Tuesday, December 18, 2018 Saturday, December 15, 2018 Categories 2018Tags Fabric, Fabric of the Year, Fabric of the Year 2018, FOTYLeave a comment on Last FOTY 2018? I cut all of the fabric that was waiting on my ironing board to be cut. I tend to press fabric when I am stressed, but I don’t always get to cutting up the pieces I need for future projects. I really should have been packing for two trips I was taking, but instead I cut fabric. Now I have a completely empty ironing board and a lot more pieces to add to my various boxes. Future projects: here I come! I finally got enough squares to make an interesting post for you. The last time I posted was in August, so not horrific, but long enough. I am not cutting up fabric and the pace I should be. I keep just piecing. You’ll notice the MetroScape fabrics mostly missing. 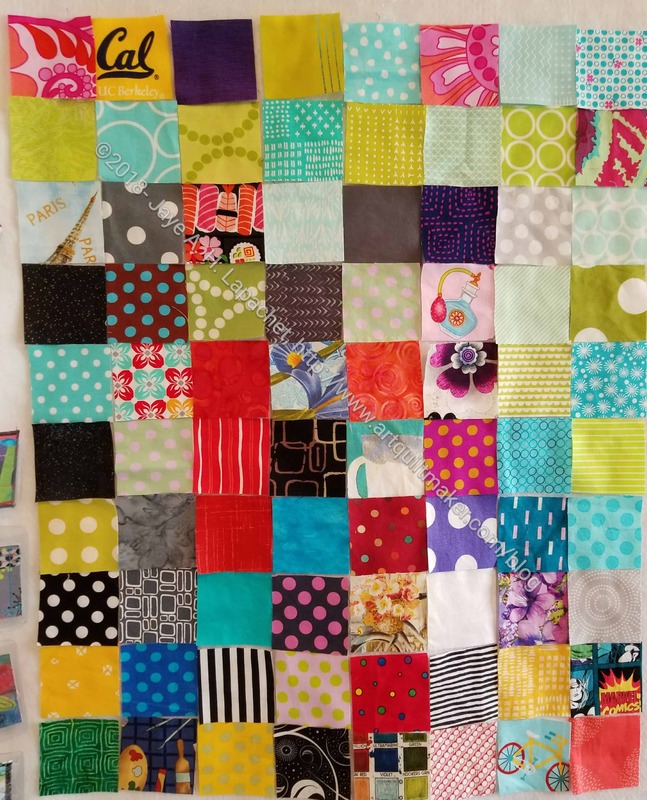 I am waiting to finish the top before I cut up many squares, because I’d rather have those fabrics missing from FOTY 2018 than not be able to finish the MetroScape quilt. I think I’ll have plenty. It took me awhile to cut enough squares to make a good post. I did it and am still making progress.You can see that many of the fabrics are from the Stepping Stones n.2 piece. There are a few from Ends n.5 and also some from the Tool Tote. 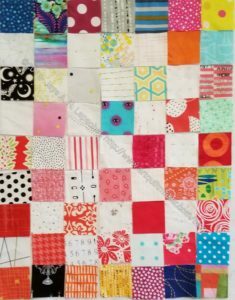 It is fun to see the fabrics I used in projects in this quilt. There are also some new fabrics, which makes me feel happy, because I am getting fabrics cut and organized for future projects. This is making me think of putting together FOTY 2017. I really need to get to that. Should I finish the Aqua-Red Sampler first or put that project back on the back burner and move to FOTY 2017? I have so many projects!!! I need more time to sew. I have a very small update for FOTY 2018. One of the things about cutting 2.5″ squares is that I can cut and cut and cut and still only have covered a space approximately 12 inches by 15 inches. 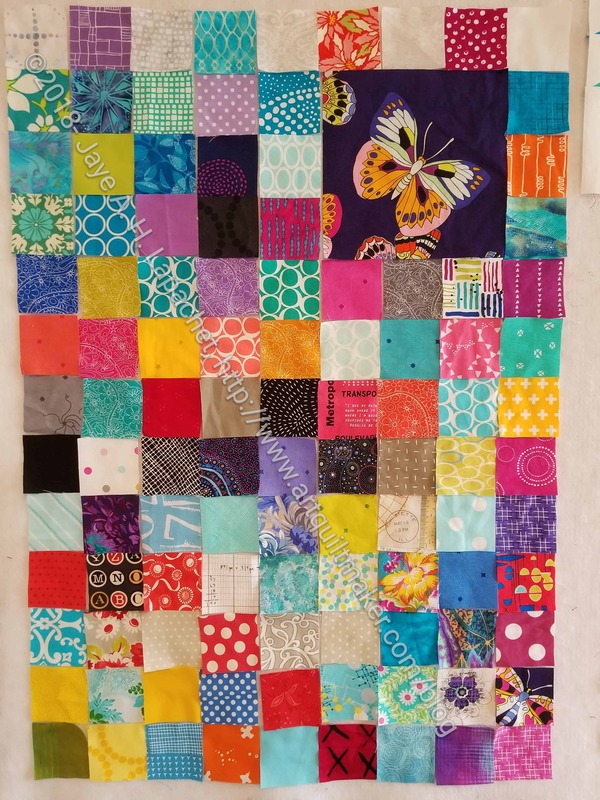 When I go to put this quilt together, this will come in handy as I can add all of the dark squares I want and realize my dream (finally). Most of the pieces cut are from new fabrics that have pressed and were waiting on my ironing board for me to cut them up. I was looking for blues so I could make more HRTs. 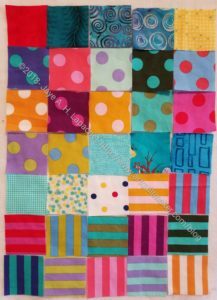 I found I needed more of the right facing rectangles to make the last Spiky 16 Patch block I need for a donation quilt. 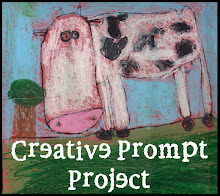 The last time I wrote about this project was March. 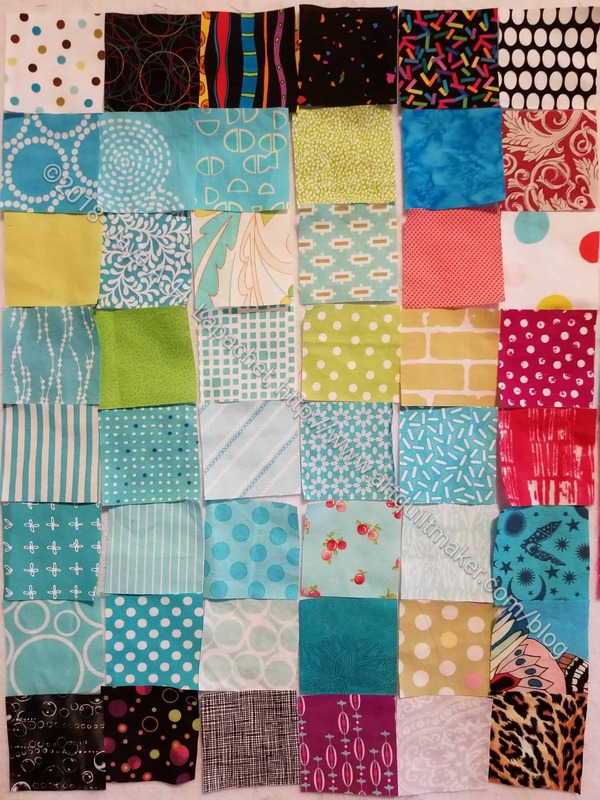 I have actually made a lot of progress on this quilt, though it might not seem like it. The shape and size are small for this year, so I will really need to step up my cutting game. Time has been short recently due to a lot of family events, but I have had time to press and cut shapes from my new fabrics. 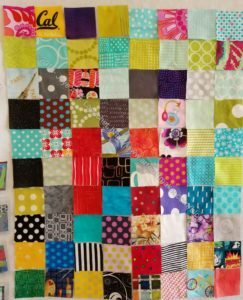 This means lots of new squares for FOTY 2018. In this group you will also see lots of familiar fabrics. Fabrics show up from the projects on which I have been working recently. There is also something a little different this time: the butterfly. After I washed the fabric, I wrote myself a note to fussy cut one of the butterflies. I did, but I am not sure it will end up as is in the final project. I don’t want one fabric to dominate. 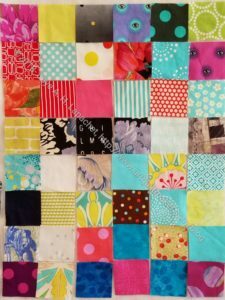 If I buy (or use some already in the fabric closet) some other fabrics with fussy cuttable designs, then I might keep it. For now, the opportunity is there. I finally had enough cut pieces to write a post on the Fabric of the Year 2018 piece. This year I chose a 2.5″ square so I could have a realistic chance of doing the Ellsworth Kelly style layout. The size of the pieces from Fabric of the Year 2017 makes this layout realistically impossible. First of all, I don’t have a design wall large enough to accommodate such a large piece. Second, I would have to cut all the pieces down to a square and I want to work with the subway tile shape. Third, I don’t want to wrestle such a large quilt. FOTY 2017 will probably be a monster anyway and I don’t want to add to it. 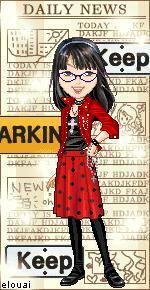 It seemed better to start afresh with an idea in mind. The 2.5″ shape also means I can get pieces out of small leftovers where needed. I am excited, though FOTY 2017 being undone still drags a bit. I am making progress on my list, so I can’t complain too much.